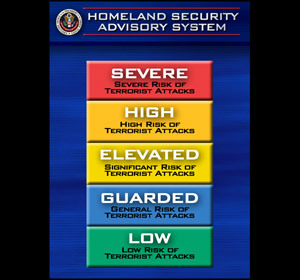 (March 12, 2002) -- The White House Office of Homeland Security has released a color coded system to disseminate information to federal, state, local officials and the public regarding the level of risk of terrorist attacks. The system, ranking threat levels and including protective measures (detailed below) that are supposed to be taken by government and the private sector to reduce vulnerabilities. are green (low), guarded (blue), yellow (elevated), orange (high) and red (severe). The system is being proposed for implementation after a public comment period. We post verbatim the statement issued by the White House Office of Homeland Security below. Speaking on CBS "This Morning," Homeland Security Dir. Tom Ridge indicated the nation is currently on "yellow" alert level and will likely remain so for the foreseeable future. Based on the color coded descriptions, this would indicate: "Significant risk of terrorist attacks. In addition to the previously outlined [lower color coded] Protective Measures, the following may be applied: Increasing surveillance of critical locations; Coordinating emergency plans with nearby jurisdictions; Assessing further refinement of Protective Measures within the context of the current threat information; and Implementing, as appropriate, contingency and emergency response." The Homeland Security Advisory System will provide a comprehensive and effective means to disseminate information regarding the risk of terrorist attacks to Federal, State, and local authorities and to the American people. National framework for Federal, State, and local governments, private industry and the public. There are many federal alert systems in our country -- each tailored and unique to different sectors of our society: transportation , defense, agriculture, and weather, for example. These alert systems fill vital and specific requirements for a variety of situations in both the commercial and government sectors. The Homeland Security Advisory System will provide a national framework for these systems, allowing government officials and citizens to communicate the nature and degree of terrorist threats. This advisory system characterizes appropriate levels of vigilance, preparedness and readiness in a series of graduated Threat Conditions. The Protective Measures that correspond to each Threat Condition will help the government and citizens decide what action they take to help counter and respond to terrorist activity. Based on the threat level, Federal agencies will implement appropriate Protective Measures. States and localities will be encouraged to adopt compatible systems. A tool to combat terrorism. Low risk of terrorist attacks. The following Protective Measures may be applied: Refining and exercising preplanned Protective Measures Ensuring personnel receive training on HSAS, departmental, or agency-specific Protective Measures; and Regularly assessing facilities for vulnerabilities and taking measures to reduce them. General risk of terrorist attack. In addition to the previously outlined Protective Measures, the following may be applied: Checking communications with designated emergency response or command locations; Reviewing and updating emergency response procedures; and Providing the public with necessary information. Significant risk of terrorist attacks. In addition to the previously outlined Protective Measures, the following may be applied: Increasing surveillance of critical locations; Coordinating emergency plans with nearby jurisdictions; Assessing further refinement of Protective Measures within the context of the current threat information; and Implementing, as appropriate, contingency and emergency response plans. 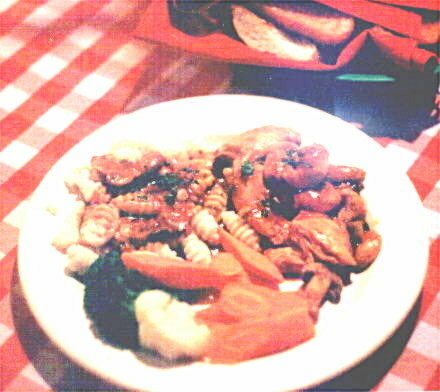 High risk of terrorist attacks. In addition to the previously outlined Protective Measures, the following may be applied: Coordinating necessary security efforts with armed forces or law enforcement agencies; Taking additional precaution at public events; Preparing to work at an alternate site or with a dispersed workforce; and Restricting access to essential personnel only. Severe risk of terrorist attacks. In addition to the previously outlined Protective Measures, the following may be applied: Assigning emergency response personnel and pre-positioning specially trained teams; Monitoring, redirecting or constraining transportation systems; Closing public and government facilities; and Increasing or redirecting personnel to address critical emergency needs.